OK, OK I admit, I wasn’t even going to decorate my Tray for Valentine’s Day. I had it all decked out in a neutral palette to match our main living area accent color of slate blue with greenery and whites. However, when I saw what my soul sisters were doing with theirs and some cute things they found at Michael’s and Hobby Lobby, I knew I had to add some extra “love” to it! I guess you’d say its kind of a mix of how I’ll decorate it every day with the addition of the cute red heartsie stuff. sign and little red glass hearts are from Hobby Lobby. I also got some red battery-operated heart lights from Michael’s and was going to put it on the tray but it seemed like too much so I’ll find another spot for them. Sweet little reminders of family and friends help add to the sweetness of the tray. The tobacco basket and blessed sign are from the dear mentioned Lisa and reminds me of a Nashville trip with the ladies. Check out Kellyann's Valentine's decorated tray HERE. I love you to the moon and back is one of mine and Mr. Nine‘s sayings. There’s a little white pitcher that was my sweet grandmothers. The pineapple plant is from my mama and the welcome pineapple vase is from my dear blog friend Lea! I could not be happier that I decided to go ahead and show this tray some Valentines love. I’ll be back in a few weeks to show you how I have it decorated for every day. See My FALL Tray Decorations HERE and My CHRISTMAS Tray HERE! Trust me when I say this Tray was probably one of my favorite purchases from last year. I never really thought much about it before but it is the most fun to decorate! These are still available on Amazon and I hands-down gave it a five-star review! 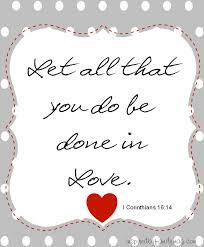 Wishing you all a "LOVE"LY WEEK! I love it. I have a tray and have used it in a while. I need to pull it back out. Yes I remember seeing this tray. I am glad you decided to decorate it because it turned out beautifully. All the hearts are making my heart happy as I am a big fan of them. Way to go Andrea! I hope you had a fantastic weekend and happy Monday! It looks great, Andrea! I love how you added the pops of red for Valentine's Day. I can't wait to see how it looks everyday in a few weeks! Hope you had a great weekend! Your tiered tray looks fabulous. I love how you just added some pops of red into your neutral look. Have a wonderful week! You did a great job my love! Your tray is so pretty and perfect for Valentine's! My favorite thing is that sweet white pitcher and it's sentimental value makes it even more special. I wish I could have found those love beads, I LOVE those!! So cute! Little Dude wanted to decorate for Valentine's Day last weekend so we drug some stuff down. We put of Valentine's and football at the same time and made a paper chain to count down the days to Valentine's Day, so we are ready! I love your tray and all of the cute finds. Enjoy your day and stay warm this week! So beautiful! You put me in a loving mood with all this beautiful stuff! I just LOVE that you decorate your home for just about every holiday lol! I wish I was as organised and inspired as you. The tray looks awesome! I love that each piece has a special meaining and place. It tells a story. Great job! It wouldn't be a holiday without your ADORABLE holiday decor inspo! You always do such a great job and that tray couldn't be cuter!! Your tray looks AH-Mazing, Friend! So colorful and I'm so glad you decided to decorate for Vday. I have yet to get my decor up! I had plans for this weekend, but the time just got away from me, but I don't have that much, anyway. STILL looking for a tiered tray that's reasonably priced! Happy VDay, Sweets!! Your tray looks adorable and so festive! Those love beads are so cute and I love all of your little wood box signs! I'm planning on showing my tray next week! This turned out so cute, Andrea! I LOVE it! I feel like the love theme is perfect, no matter if it's Valentine's day time or not! This is so cute, I absolutely adore your tray. I haven't been to Michael's in a long time, and need to change that. They always have such festive things. Hope your Monday is wonderful, xo! It turned out fabulous Andrea. But really it's smart to have it all neutrals so you can just add the extras for any holiday!! Oooh I love it all. Of course you had to decorate that tiered tray! I love the tray and you can do so much with it (and do!). I am itching to pull out my Valentine's Day decorations now! I LOVE it! it looks so fantastic. I think there will be a trip to Michael's in my future. It looks so good! Great job. I wish we had a Michel's near us. Hope you have a great week! This is so dang cute! I haven't decorated for V-Day yet but I'm hoping to start today! I always love decorating my tiered tray... it's one of the most fun things to decorate! Hi Andrea, oh your tray is decorated so nice for Valentine's Day. Thanks for sharing at C&C with J&J. Stay warm and enjoy the week. Your tiered trays are the best! It's reminding me to put up my valentine's day decor before it's too late! Your tray is so festive!! Love it! Have a wonderful Monday! So cute! I always love how festive you are! I love that you and the mister use that phrase, it is such a good one! Hope your Monday has been magnificent! It's so cute! I'm glad you decided to decorate it! I love the felt hearts and wood elements. I need to start going into Michaels more, I just love those puffy hearts. I haven't seen that 'Love' beaded garland at Hobby Lobby, but it is perfect! Love the red color! I absolutely love my 2 trays and I love decorating them for every holiday! I am slowly but surely getting more confidence in decorating them! You and Lisa and Shelly have certainly helped me with that! xo Have a fabulous week! That is just so cute and bursting forth with LOVE! So glad you are enjoying your little pineapple vase. Stay warm my friend! This is SO pretty!! I love the succulents, too, and the pops of red. 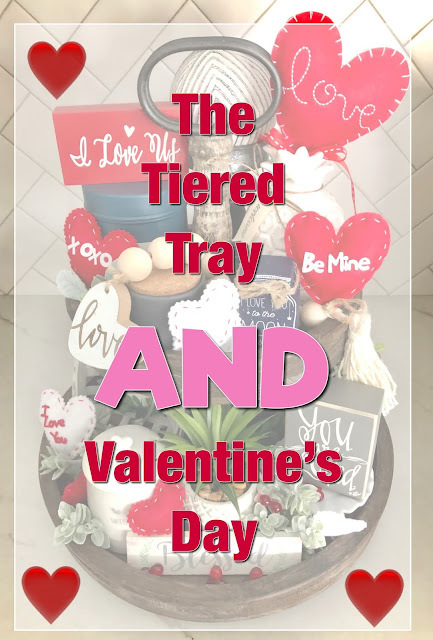 I would have never thought to decorate the tray - but it is VALENTINE PERFECTION! I love all the girly touches too it.. and you can never have enough red OR pink, right? You are the queen of home decor. Come over and decorate my home, please?! Love you cutie! Have the best week! I look forward to every single one of your tray posts!! It always turns out so darn cute and makes me want to go out and get everything! WOW, so lovely. What a fabulous job. I love the pops of red with it and the fun Valentine's Day decor! I still need to get one of these trays. One of these days when I find the right spot for it. So so cute!! Thanks so much for linking up with us at the Share Some Love party. Pinned. This post was picked as one of my featured favorites today! Thanks once again for sharing with us. That is such a cute way to decorate for Valentine's Day! Your tray runneth over with goodness and love, my sweet. Your tiered tray is beautiful! It's been pretty busy here with all the school closings so I am hoping I can round up enough around the house to fill mine out. I got it for Christmas and haven't had a chance to put it together yet! Love it! It is adorable and those felt hearts are the cutest! I had to refrain from buying more Valentine's decor this year but you gave me great ideas! I LOVE this adorably styled tray. I'm so glad you and the girls encouraged me to get my own tray. It's a great piece for the coffee bar! You're the best. I love your pops of red. I just stlyed mine as well and posted it on my blog. I went with pink. I love how festive it makes the space. That tray is just the cutest! Your Valentine's three tier tray with all the pops of red is adorable! I have a rectangular three tier tray, maybe I should give it a try. Thanks for sharing. This is so cute! I love how it was so easy to dress it up for Valentine's by just adding a few pops of red to your usual decor. And I agree, tiered trays and so much fun to decorate! Thanks for sharing at Sweet Inspiration! What sweet decor!! Looking forward to seeing how you style for every day decor! Thanks so much for sharing on "Sweet Inspiration"! I am so glad you decided to decorate your tray because it turned out beautifully! I love all the color and festive items. You were one of my features this week at Best of the Weekend. Thanks for linking up and enjoy your weekend! Your tiered tray is absolutely perfect for Valentines! I have been looking for a tray but haven't found the perfect one. I have a smaller kitchen, and I need to find a good spot for it to be a focal point.